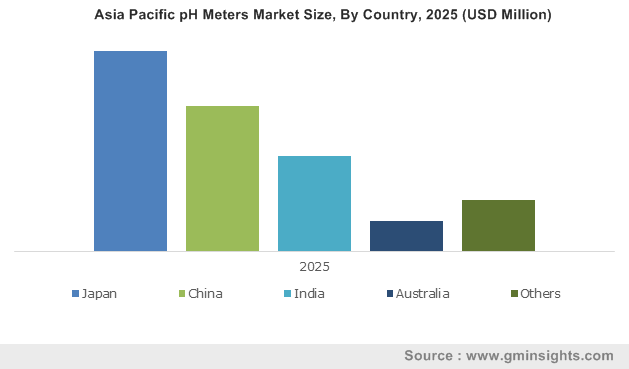 pH Meters Market size was valued at USD 866.9 million in 2018 and is expected to witness 4.1% CAGR from 2019 to 2025. Technological advancements integrated within pH meters is expected to drive the industry growth in forthcoming years. Industry players have taken efforts to develop digital pH meters that helps in reducing the errors. Such technologically advanced pH meters find variety of industrial applications. Also, recently developed pH meters are waterproof and durable that further escalates its preference for environmental testing. Currently, pH meters with bluetooth connectivity providing wireless measurements are in demand. Thus, continuous technological upgradations in pH meters has positively impacted the industry growth. Favourable regulatory scenario in developed as well as developing countries has propelled industry growth significantly. Regulatory authorities such as FDA and EU Commission introduce amendments in the laws and regulations that helps in reducing errors in medical device manufacturing. This helps the pH meter manufacturers to maintain the standard and accuracy of pH meters. Further, regulatory authorities also play an important role in governing the demand and supply trends for medical devices. Hence, presence of regulatory bodies that support developments in pH meters will certainly boost the industry growth. However, complications associated with pH measurement may hamper the industry growth to some extent. Benchtop pH meters segment was valued at USD 400.5 million in 2018 and is expected to retain its dominant position in industry throughout analysis period. Rising demand for benchtop pH meters in research labs for measuring pH of chemicals, buffers, and reagents fuels the industry growth. Additionally, some bench top pH meters have user interface that allows data transfer to computer thereby, making bench top pH meters more user friendly. Such features allow easy integration with automated systems and propel its demand in research processes. Portable pH meters segment will witness 4.0% growth from 2019 to 2025. Portable pH meters are small, pocket-sized, battery-powered and easy-to-carry that makes them suitable for pH measurements on the field. Increasing usage of portable pH meters due to wide range of industrial as well as environmental applications owing to their convenient and compact features will propel segment growth over the coming years. 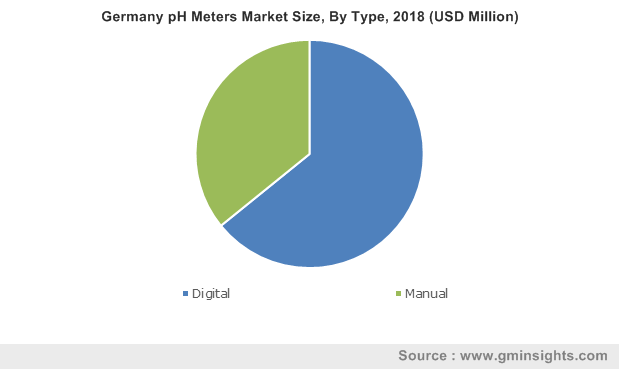 Digital pH meters segment was valued at 559.0 million in 2018 and will have significant revenue size over the coming years. Digital pH meters are more accurate as compared to the manual pH meters that increases its adoption amongst the researchers and pharmaceutical companies. Pharmaceutical and biopharmaceutical companies engaged in the drug discovery processes prefer digital pH meters with high precision that propels the segment growth. Manual pH meters segment is expected to grow at 4.5% throughout the analysis period. Recently developed pH meters are user friendly that increases adoption of manual pH meters specifically in food and beverage industry that demands control over operations. Manual pH meters gives better operational control that stimulates segmental growth. Environmental research and pollution control segment will grow at 4.4% throughout the analysis period owing to introduction of technologically advanced and water proof portable pH meters utilized in controlling water pollution. Also, pH meters are routinely used in studies and cases conducted by research institutes to analyse impact of various chemicals on soil that further escalates the segment growth. Food and beverage industry segment was valued at USD 294.9 million in 2018. Variations in pH value affects the consistency, shelf life and flavour of the food products. Therefore, pH plays a significant role in food processing industries and is used as a major control parameter to ensure that the food products and beverages meet the regulatory quality standards. Hence, growing adoption of pH meters for maintaining consistency and enhancing shelf life of food products and beverages will foster segmental growth. Government and academic institutions segment estimated to witness 3.8% growth from 2019 to 2025. Water monitoring programs undertaken by government and various academic experiments drives the demand for pH meters. Additionally, academic institutions require pH meters for research studies. For instance, pH meters have been extensively utilized to analyse the capabilities of nano particles that further finds applications in cancer therapy. Aforementioned factors are expected to trigger the business growth. 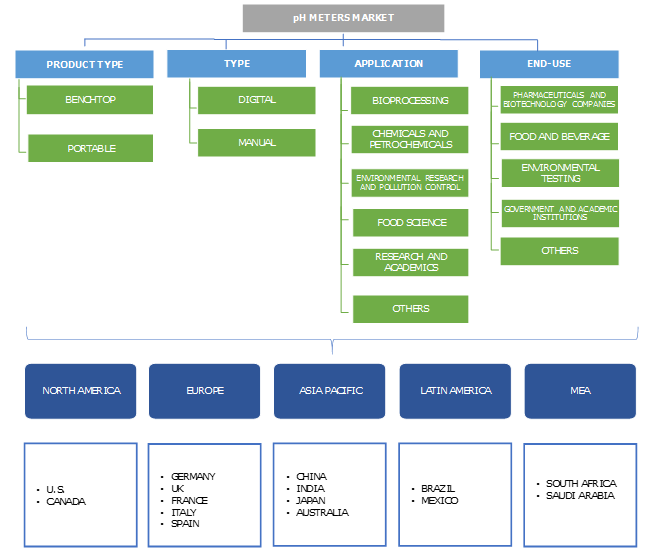 North America market currently dominates the global industry with revenue USD 357.5 million in 2018 and the scenario is likely to remain so over the forecast period. High awareness level regarding availability of technologically advanced portable pH meters triggers the regional market growth. Moreover, favourable regulatory scenario for pH meters market enables superior quality of devices enhancing the regional growth. India market is estimated to grow at 4.4% from 2019 to 2025. Foodborne and waterborne diseases such as cholera and typhoid is a major concern in India still affecting significant portion of population. Therefore, adoption of portable pH meters is specifically high in treatment of environmental pollution to reduce mortality rates due to contagious diseases. Also, Indian government takes several initiatives to maintain optimum levels of air pollution that further boosts the demand for pH meters. Beckman Coulter, Emerson Electric Co. (Rosemount Analytical), Thermo Fisher Scientific, Mettler Toledo, Agilent Technologies, are some of the eminent industry players. Other players include Horiba Group, Hanna Instruments, Jenco Instruments, Metrohm and Hach. Geographical expansions, strategic mergers and new product launch are some of the key initiatives undertaken by the payers to sustain the market position. For instance, in October 2017, METTLER TOLEDO Process Analytics launched its Pro2Go handheld pH meter. It provides fast measurement, great durability and one-handed operation. Introduction of such new products will boost company’s revenue generation. pH meters industry can be traced back to 1909 with the introduction of pH scale by Søren Sorensen. The first pH meter was developed by Arnold Beckman in 1934. Later in 1936 the pH meter was successfully sold in the market and in 1937 electrodes were redesigned that possessed better compatibility. Since past years, the pH meters industry has evolved considerably but recently developed pH meters follow more or less the same design and working pattern. However, pH meters market is not completely saturated and hence, new players willing to enter this market have significant growth opportunities. Developed countries have been explicitly utilizing the pH meters in research as well as other industrial applications. Also, as the industry is in the developed stage, there is enough awareness regarding pH meters in developing as well as underdeveloped economies. Usually, underdeveloped economies are not explored by the key leaders. Therefore, new entrants will have numerous opportunities to create brand position by penetrating emerging economies with significant potential.